Winding Down | RV There Yet? It’s hard to believe there are only 2 days left of our project here in Hidalgo. Gary is still working hard on totally remodeling a bathroom, the other guys have been hanging drywall and building shelves. We girls started painting some outside doors and building trim, and are now trying to finish off repainting their sign. It’s three sided and concrete, so we were painting it “on location”. Since none of us are even craft painters, we were pretty nervous about the job, but we tackled it nonetheless. Here’s a picture of the six of us in front of “our” sign. (Hopefully we’ll get a chance to get a group shot when we have actually changed out of our paint clothes!). It’s been a fun project (dental work notwithstanding! ), and we’re glad to have been here. 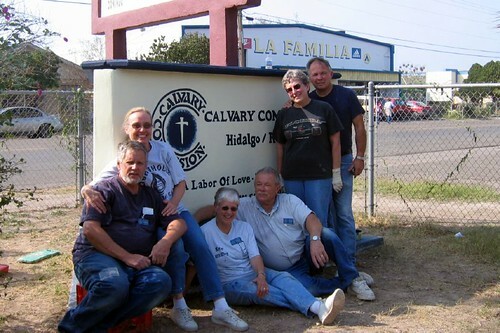 One of the outreaches of Calvary Commission is the Josiah and Bethany Orphanage in Reynosa, Mexico. (Named for the two children of Keith Green that were killed with their father in a plane crash). Hopefully we’re going to visit the orphanage on Thursday. We’re all looking forward to that! And what is next on our journey? From here we head just about 15 miles north to the town of Pharr for our March Project – Grace Community Church/School. We’ll stay here through the weekend, though and just enjoy a little down time (although there is a trip to our favorite dentist on Friday to look forward to!). Maybe we’ll even fit in a trip to something more interesting than Home Depot! Previous PostAnd the beat goes on…..Next PostBeautiful, beautiful children….